This recipe is quick, so it’s the perfect dinner to whip up on those busy weeknights. 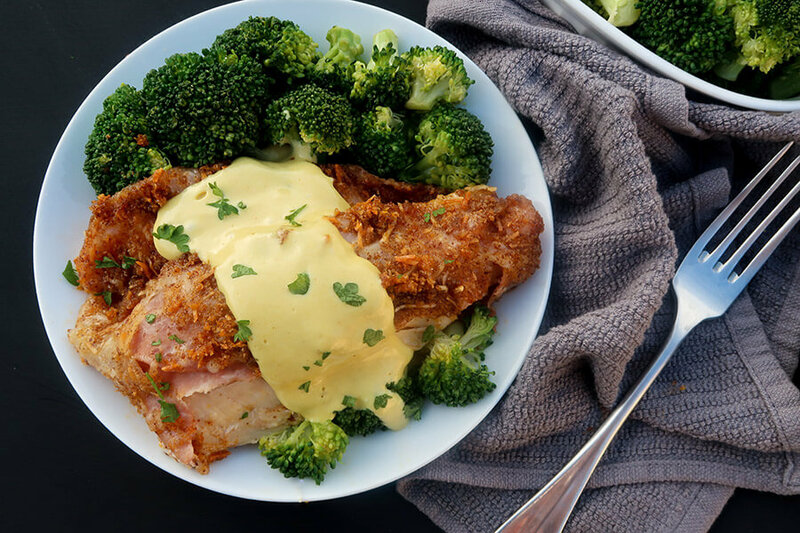 I’ve taken the classic chicken cordon bleu recipe and reformatted it to be keto friendly and easy to prepare. I really like this dish because the flavor combo of ham, Swiss, Dijon mustard, and chicken are hard to beat. I also love that even though this recipe uses chicken breasts and bakes them in the oven – they come out nice and juicy. With a typical cordon bleu you might worry about creating a roulade, setting up a breading station, and pan frying. Instead we’re going to layer the chicken into a casserole dish along with the ham and Swiss cheese. 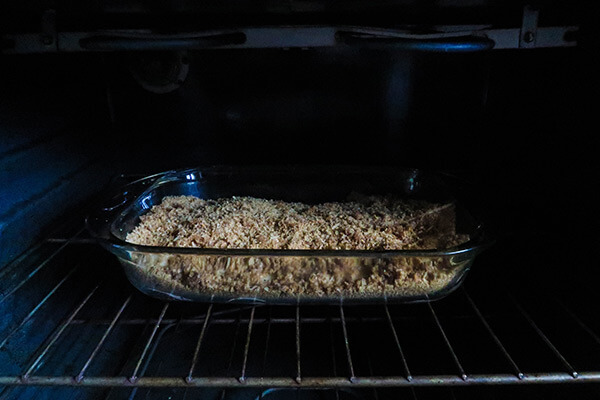 Then we’ll top everything with a pork rind crust and bake till perfection. It’s so easy! I’ve also included a simple version of the Dijon sauce. 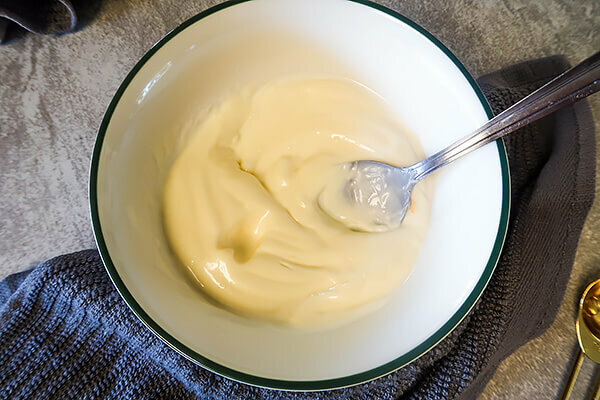 You can keep it spreadable and thick with just the mayonnaise and mustard, or add a little chicken broth to create something you can easily drizzle over the completed dish. I kept it nice and thick for the pictures, but I like it both ways. Write this recipe into your weekly meal plan and then let me know how you like it! 2. 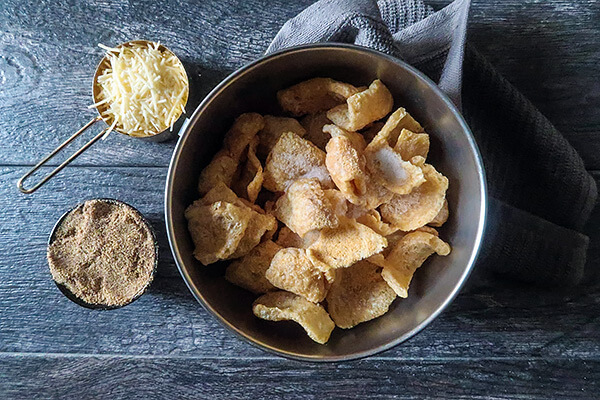 Blend pork rinds, flaxseed meal, Parmesan cheese, garlic, and 1/2 teaspoon of salt in a food processor. Set aside. 3. 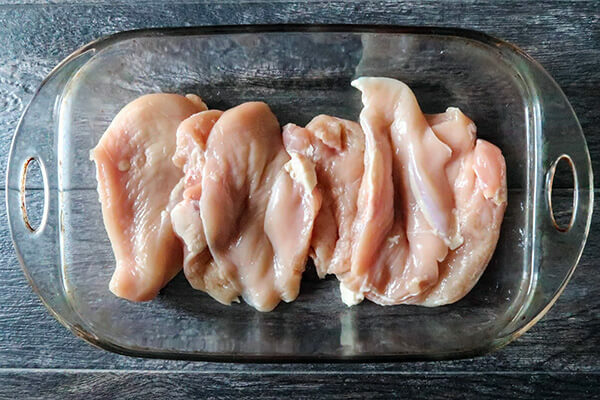 Take each chicken breast and halve them lengthwise so that you have six pieces. 4. Lay the chicken into a 9×13″ casserole dish. Season with salt and pepper. 5. 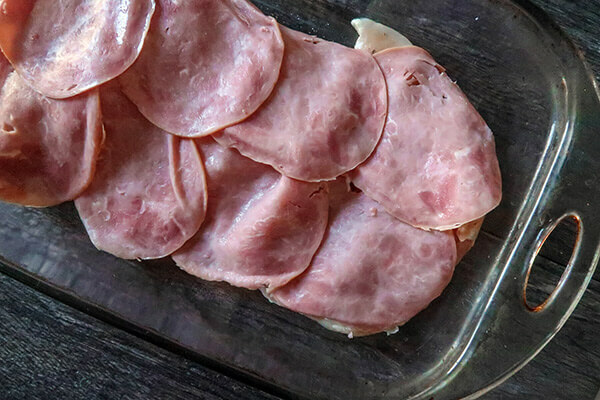 Place the slices of ham on top of the chicken. 6. 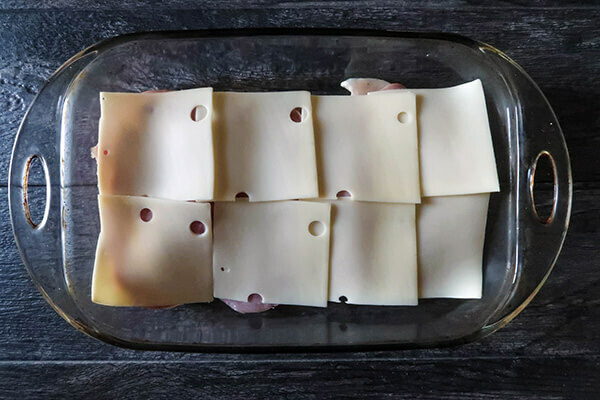 Layer the Swiss cheese on top of the ham. 7. Spread the pork rind mixture over the top of the casserole. 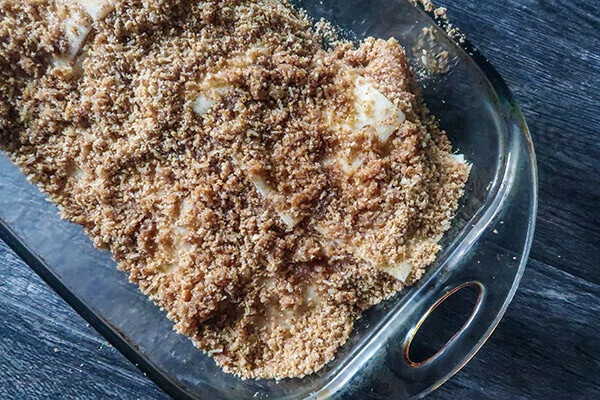 Drizzle on the melted butter and mix it into the crumb topping with a fork. The topping will clump together somewhat. 8. Bake the casserole uncovered at 350°F for 40-45 minutes, until the topping has browned and sunk into the melty cheese. Test the chicken with a thermometer to ensure that the chicken has reached 165°F. 9. While the casserole is baking, whisk together the mayonnaise and Dijon mustard. If you’d like for your sauce to be less thick then you can add 2-3 tablespoons of chicken broth. I like it either way. 10. Cut the casserole into six pieces and serve with sauce. 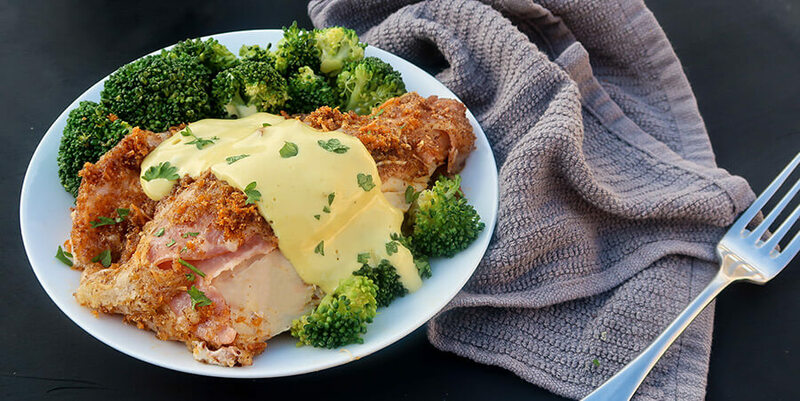 This makes a total of 6 servings of Easy Keto Cordon Bleu. Each serving comes out to be 585 Calories, 41.6g Fats, 1.69g Net Carbs, and 46.93g Protein. This makes a total of 7 servings of Easy Keto Cordon Bleu. Each serving comes out to be 501.57 Calories, 35.65g Fats, 1.45g Net Carbs, and 40.23g Protein. 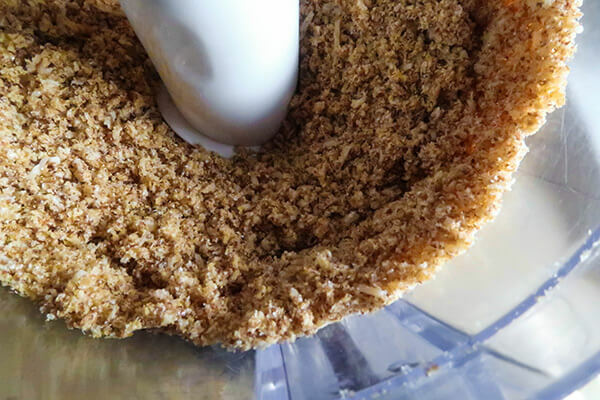 Blend pork rinds, flaxseed meal, Parmesan cheese, garlic, and 1/2 teaspoon of salt in a food processor. Set aside. 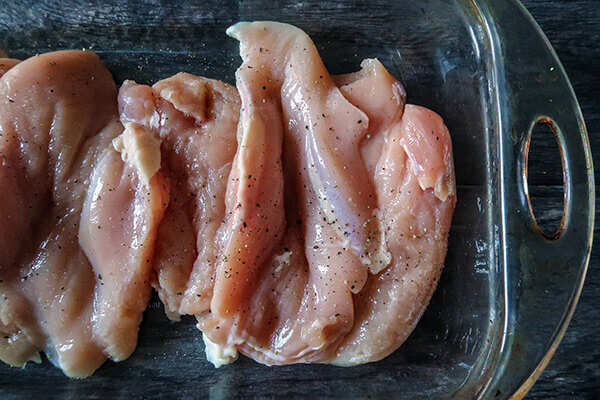 Take each chicken breast and halve them lengthwise so that you have six pieces. Lay the chicken into a 9x13" casserole dish. Season with salt and pepper. Place the slices of ham on top of the chicken. Layer the Swiss cheese on top of the ham. Spread the pork rind mixture over the top of the casserole. Drizzle on the melted butter and mix it into the crumb topping with a fork. The topping will clump together somewhat. Bake the casserole uncovered at 350°F for 40-45 minutes, until the topping has browned and sunk into the melty cheese. Test the chicken with a thermometer to ensure that the chicken has reached 165°F. 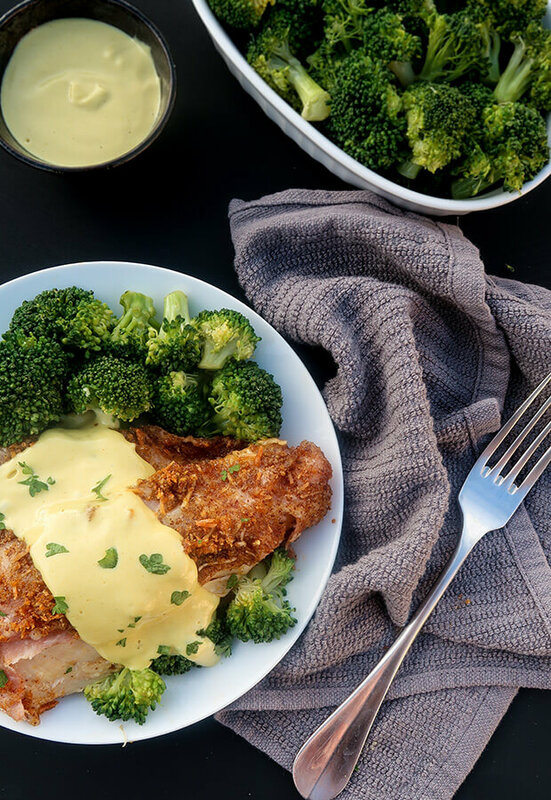 While the casserole is baking, whisk together the mayonnaise and Dijon mustard. If you'd like for your sauce to be less thick then you can add 2-3 tablespoons of chicken broth. I like it either way. Cut the casserole into six pieces and serve with sauce.